Even in the happiest of times, Timothy Showalter – who records under the moniker Strand of Oaks – often finds himself amongst a haze of anxiety. 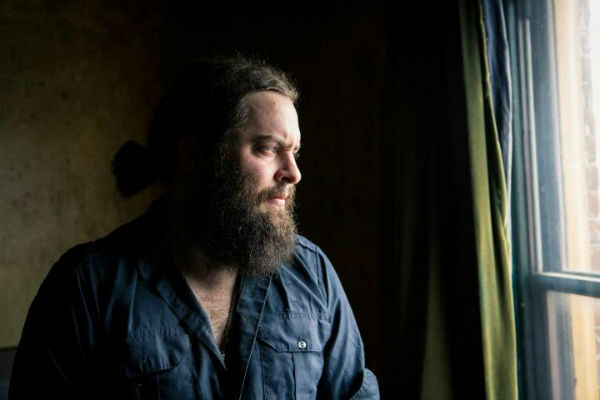 It’s an unusual mindset for the Pennsylvania by way of Indiana musician, considering the success he’s had as a person and a musician. But especially with the recent arrival of his latest release, Dark Shores, Showalter maintains a guarded appreciation for life. Part of his anxiety might have to do with turning 30 but he’s not about to wallow away all his time and energy on this thought, and is constantly writing new songs. Acceptance and perseverance are just two of the words that have deep meaning for Showalter, and they frequently find their way into his lyrics. “It’s important to accept mortality and the fact that life is full of good and bad parts,” he says. Sometimes struggles come from unexpected places, but Showalter finds his way through it by writing songs. That is prevalent on Dark Shores, an album produced by singer-songwriter John Vanderslice and recording engineer Ian Pellicci. Following a steady stream of touring behind his last album Pope Killdragon, Showalter found himself with a lot of free time. With not much to do at home and his wife Sue working, he found his mind wandering and exploring a lot of thoughts. From that idea the song for the title track took root and provided a perfect catalyst for a new album. Between “Dark Shores” and the final song he wrote, “Diamond Drill,” the idea for an album full of bizarre stories took shape. For Showalter, it’s fascinating to look at the lyrics and melodies between the two songs and see the full scope of the record. So far, he feels that the album’s been well received. Part of that success for not just Dark Shores but his three albums is the vivid and sometimes surreal details in his lyrics. For many, like fellow songwriter Joe Pug, it’s easy to be drawn to Showalter’s lyrics. Pug formed a close friendship with Showalter over a lengthy tour last year, traveling in the same tour van. From the beginning Pug knew that Showalter was who he wanted to tour with. Ryan Matteson, creator of the popular Muzzle of Bees blog and Strand of Oaks manager (and who also released the Pope Killdragon vinyl on his Ten Atoms record label), shares the same sentiment. While his debut Leave in Ruin was more autobiographical for Showalter, Pope Killdragon and Dark Shores present a more altered reality. His lyrics tell stories that may be based on true events but he takes liberties with the details. Characters murder John Belushi’s drug dealer, get abducted by aliens, go bowling with mythical giants, and commune with John F. Kennedy’s illegitimate son. There’s plenty of his “strange imagination” in Dark Shores. This includes “Satellite Moon,” which weaves that imagination “into very real things that were going on in my life and wondering about marriage and how to keep a marriage going.” But in his altered reality the struggles going into that took shape in the form of an astronaut farmer. Another good example of the extent of Showalter’s creativity on Dark Shores is “Maureen’s”. Showalter describes the song as a cinematic continuation of Pope Killdragon and perhaps a sequel to the song “Bonfire” off that album. “Maureen’s” is special to Showalter as it was the name of an ice-cream stand where he went on his first few dates with his wife in Wilkes-Barre, Pennsylvania. While “Bonfire” features a couple that is trying to find a way to make their lives work in the bleakest of apocalypse, “Maureen’s” feels like it takes place a couple years later when they’re still living in the wasteland of the world but their lives aren’t as good anymore. But the twist is that instead of problems from the apocalypse it’s more the normal daily things that wear on a person so much that your relationship feels light years away. Accepting one’s situation became important for Showalter as he continued to write the lyrics for the songs on Darker Shores. Initially when he started working on the album he recorded some of the instruments with Ben Vehorn, who had helped produce Pope Killdragon. With the success of Pope Killdragon and its synthesizer heavy prog-folk sound, Showalter wanted to go for a similar sound – one that would mix an epic Tangerine Dream-like synthesizer soundscape with the disorienting lyricism of a singer like Kate Bush. The lyrics called for a scaled back approach. The unexpected arrival of John Vanderslice (as well as Ian Pellicci) to produce the album certainly gave Showalter a boost of confidence that he could achieve this. Through a series of conversations, Vanderslice and Showalter figured out the sonic direction of the album. Ian Pellicci, a co-producer and engineer for the album, also helped plenty in getting the songs right. Vanderslice, who knows the importance of vocals, wanted to get them sounding right. “I do believe that if you get the singing right, get it recorded properly and out front, that everything else follows,” he says. Working at Tiny Telephone made that even more possible as Showalter says the gear there is only to make the record better rather than being everything but the kitchen sink. The biggest reason he pursued recording there came from hearing albums recorded there like Sunset Tree by The Mountain Goats. Showalter, who had toured Pope Killdragon as both a solo act and a four-piece band, was joined in the studio by the rest of the band. According to Showalter, Dark Shores is the first time he’s been able to capture his voice close to how it is live. For Matteson, the songs certainly succeed. “I think he did a great job of deconstructing his songs into their simplest form and getting the most out of his amazing voice and leaving space for the songs to be really powerful,” says Matteson. Picking the right version of the song wasn’t always easy, though, for Showalter. Last year Showalter had recorded an early version of the song “Spacestation” for a session for Shaking Through, which had the heavy synthesizer and drama he initially intended for “Dark Shores”. While he likes both versions of the song – one with plenty of synthesizers and drama and the other more restrained – it’s all about making tough choices and picking the song appropriate to the album’s sound. Showalter never expected he’d get the chance to work with John Vanderslice let alone have one of his personal musical heroes work diligently with him on his songs. This opportunity had Showalter ready to send demos of his work but Vanderslice’s adamant stance about not listening to demos made things a bit worrisome. Once he flew out to work at Tiny Telephone and played the songs on guitar he quickly realized Vanderslice knew what he was doing. Showalter would play once through and they’d set up whatever microphones and instruments were needed. It helped that the two shared similar music tastes, including David Bowie’s album Low. 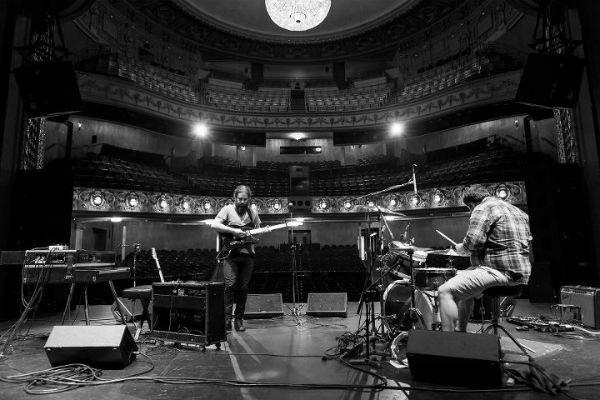 Over the past few years Showalter has gotten plenty of opportunities to play and hang out with his musical inspirations including Eric Bachmann from Crooked Fingers and recently The Tallest Man on Earth.